NASSAU, The Bahamas – A preliminary report from the Caribbean Community’s (CARICOM) Election Observer Mission has given The Bahamas high marks for the conduct of the 2017 General Election. The elections were conducted May 10, 2017, during which the Free National Movement won 35 of the 39 seats contested to form a new government. An Advanced Poll was held May 3, 2017. Parliamentary Registration Department officials say 88 percent of the 181,000 registered voters in The Bahamas cast ballots during the General Election. Parliamentary Commissioner (Actg.) 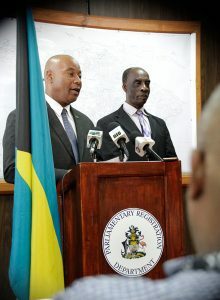 Charles Albury said Wednesday that officials at the Department had received a preliminary report from the CARICOM Election Observation Mission with respect to the conduct of the 2017 General Election, effectively congratulating The Bahamas on the conduct of the elections in many instances, while offering recommendations for improvement in others. Commissioner Albury said Mission Observers, who visited 223 Polling Stations throughout The Bahamas, observed that polls opened on time in the majority of polling stations; that most of the stations were fully staffed and that the majority of those polling stations had at least two agents present representing the two major political parties. The Observers also found that the polling stations were conveniently located in the majority of cases and easily accessible to voters including those with disabilities. The Mission further observed that the materials and supplies on hand at most of the polling stations were available in the required quantities and that adequate security was in place at all locations with the officers conducting their duties in a professional manner, which they felt contributed to the level of calm that prevailed during the voting process. The report further noted that poll workers appeared to be “focused” as they steadily carried out their required procedures to ensure that all eligible voters who turned out to vote were able to do so. The Report noted a number of areas for consideration for improvement to the process. “The Mission also pointed out that most of the pre-poll activities including the late publication of the advanced poll register; voters’ inability to confirm beforehand whether or not their names appeared on the Advanced Poll Register; and the incorrect polling station numbers being written onto the Voters Cards are among several issues that can be addressed with the introduction of modern technology into the voter registration process,” Commissioner Albury said. “[It is their belief] that this will facilitate a more timely extraction and publication of the Voter Register as well as provide voters with the ability to carry out online verification to determine if their names appear either on the Advanced Poll Register or the Election Day Register,” Commissioner Albury added. A full report will be forthcoming from the Mission. Polling Divisions 10 and 12 for East Grand Bahama have been changed please review the Family Island Polling List.